Did You Get YouTube’s New Sharing/Messaging Feature? 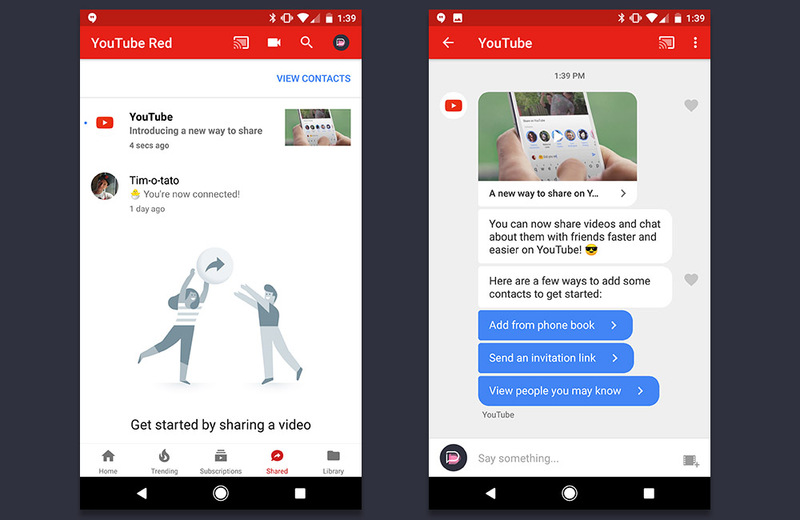 On Monday, YouTube announced its new sharing feature for at least the third time (that’s not an exaggeration), suggesting that it was finally rolling out to everyone. I still didn’t get access until Tim invited me yesterday, but it is readily available now to everyone even if you need a bit of help. We thought we’d just check in to make sure you all knew that this week is the week for it and to be sure you got it. What is the new sharing feature in YouTube all about? It’s about sharing, silly. You now have a dedicated panel for sharing videos in conversations with friends and family. I know, I know, “LOLzerpants at Google having another messaging platform!” But really, though, it’s kind of cool and useful. Instead of having to share YouTube videos outside of YouTube in whichever messaging app you use through a link or other means, you can just spend all of your time in YouTube sending off the latest floating chicken balloon clip to your bro pack. Then you guys can chat about how funny it is, watch related clips, and then move on to the next. The sharing feature pulls from your contacts to help you get into conversations, lets you include 1 or more people in a thread, provides recent history for quick sharing, and other messaging features you are likely familiar with. Again, the feature is rolling out as I type this. If you aren’t seeing it, ask a friend to send you an invite link.